A California man pled guilty to a crime he says he didn’t commit. A Nevada woman was represented by four different attorneys in as many years. A Louisiana man received a warrant for failure to appear in court when he was, in fact, in jail. The cases range from animal cruelty to firearm charges in locales as diverse as coastal cities and the rural South. But they are united by a common factor, advocates say: underfunded public defenders offering poor advocacy to their indigent clients. Now, in lawsuits across the country, these low-income defendants have become the plaintiffs, suing over a dearth in resources for constitutionally mandated services. “In almost every state, public defenders are laboring under excessive caseloads without the people power or investigative resources they need,” said Jason Williamson, deputy director of the American Civil Liberties Union’s Criminal Law Reform Project. Cases are pending in Nevada, Idaho, Missouri, California, Pennsylvania and Washington, inspired by an ACLU-led lawsuit in New York that boosted state public defense funding there. The ACLU has won reforms with similar lawsuits in Montana and Michigan. The suits have met resistance from governors and attorneys general. Sometimes, public defenders are the litigation’s fiercest opponents. And not all of the ACLU’s cases have been successful. A year ago, a federal judge nixed litigation in Utah, saying the arguments were “generalized” and that allegations public defenders didn’t meet with clients, missed hearings and pressed for plea deals weren’t enough to show irreparable harm unless the plaintiffs had been convicted. Kimberly Hurrell-Harring knew she should have put her foot down when her husband begged her to smuggle drugs into Great Meadow Correctional Facility in Comstock, New York, where he was doing time. But one day in 2007, she made her regular 240-mile drive from Rochester to the prison with less than an ounce of marijuana and was arrested for the first time in her life, according to court records. Hurrell-Harring had been working two jobs as a nurse to support her sick mother and two young daughters. 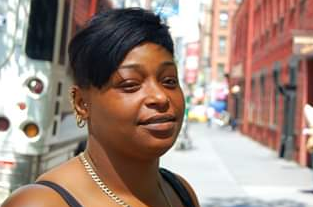 She couldn’t afford an attorney, and was entitled to court-appointed counsel. But no lawyer came to her arraignment, so she was held on $10,000 bail. Her public defender didn’t answer her calls or plead down her charge from a felony that could have kept her in prison for up to seven years to a misdemeanor that carried a maximum one-year sentence. Hurrell-Harring pled guilty to the felony and got a six-month sentence with five years probation, but her days in court weren’t over. She joined defendants from five New York counties in a class action alleging the state had flouted the Sixth Amendment by failing to provide adequate counsel for indigent defendants. They were represented pro bono by the law firm Schulte Roth & Zabel and the ACLU. After seven years of litigation, the case won significant reforms, quadrupling New York’s annual public defense spending. “The Hurrell-Harring case set the standard and gave us some hope these kinds of cases can move forward,” Williamson said. 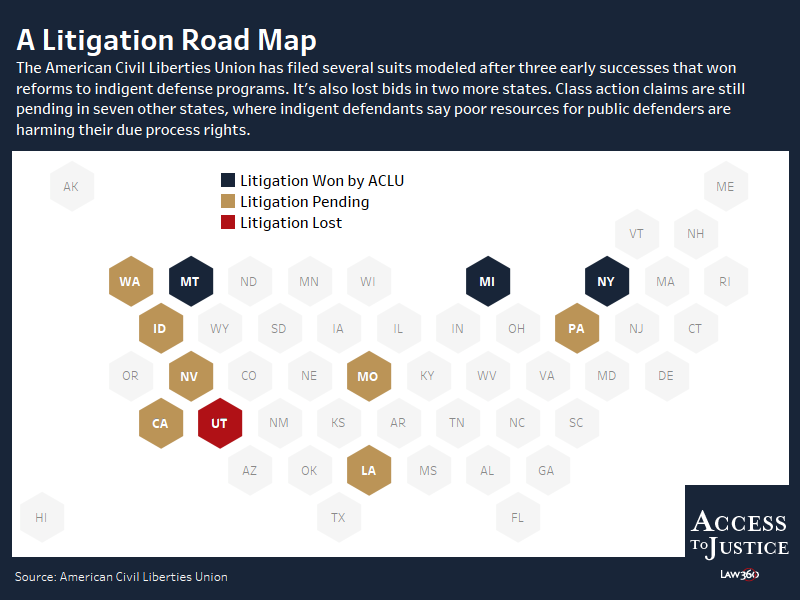 The ACLU has filed several suits that follow the Hurrell-Harring road map in other states: It identifies a few low-income defendants who’ve received little legal advice from their court-appointed attorneys in criminal court and then files class claims on their behalf. That wave of litigation includes claims from Colleen Davison, who sued over the public defense system in Grays Harbor County, Washington. She said the handling of her 11-year-old granddaughter’s assault charges was “deplorable” and “a circus.” Her attorney did not challenge the decision to set bail at $5,000, didn’t use the girl’s past mental health issues as a defense and didn't challenge the prosecutor’s failure to seek a capacity hearing. The public defender was “in the back pocket of the prosecuting attorney,” Davison contended, and both attorneys dug in their heels on a plea deal she didn’t want. “There was no defense. The justice system really let us down, but I feel like we’re going to get some good outcomes out of this,” she said of the pending litigation. The Washington State Office of Public Defense declined to comment on pending litigation. She decided to sue after sitting through hearings for other children while waiting for her granddaughter’s case to be called. “I thought, ‘Oh my gosh, this is systemic. They’re all getting railroaded,’” Davison said. The ACLU’s lawsuits contend states are flouting the U.S. Supreme Court’s landmark Gideon v. Wainwright decision by providing ineffective public defense. That unanimous 1963 ruling held that the Sixth Amendment guarantees court-appointed counsel for indigent criminal defendants. But the high court didn’t offer any guidance on how states should bankroll that due process right. 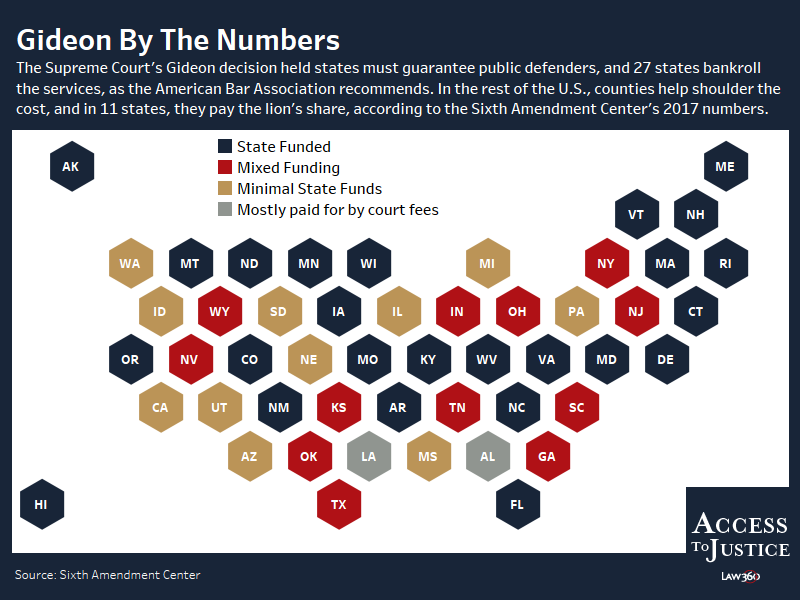 Funding sources vary from state to state, and according to a 2017 report from the Sixth Amendment Center, 27 state governments foot the whole bill for indigent defense, as the American Bar Association recommends. Two states, Pennsylvania and South Dakota, leave the responsibility entirely to counties. In 12 states, local governments pay most of the share of indigent defense in trial court. Neighboring counties can have wildly different resources based on their tax revenues, according to David Carroll, executive director of the Sixth Amendment Center, which advocates for better public defense funding. “The ones who need indigent defense services the most are the ones least able to pay for it,” Carroll said. In California, for example, the state contributes about 10 percent to public defense funds. Significant local inequities lead to varying opinions on the best funding method, according to Norman Lefstein, an Indiana University law professor. “Public defenders in California who are better funded feel they’d be worse off if the state got involved, and those who are worse off feel they’d be better off,” he said. Carroll said well-heeled communities like San Francisco and Silicon Valley have “some of the most innovative public defender’s offices in the country,” but rural areas tend to contract out indigent defense, paying private attorneys flat fees. And even in cities like Fresno, which has a public defender’s office, inadequate funding means caseloads exceed maximums recommended by the ABA, Carroll said. State spending is hardly a panacea, either, says Marea Beeman of the National Legal Aid & Defender Association. In Missouri, for example, all public defender funding comes from the state, but per capita funding is among the lowest in the nation. The funding burden is sometimes shouldered by defendants, even those too poor to afford an attorney. In 43 states, there are fees associated with getting a public defender, according to the Brennan Center for Justice. Bunton welcomes a state suit filed in 2017 by a class of indigent defendants, set to go to trial in July. While the suit wasn’t filed by the ACLU, Lisa Graybill, a Southern Poverty Law Center attorney representing the class, said the Hurrell-Harring case “absolutely inspired” the litigation. The state of New York settled the Hurrell-Harring case on the eve of trial, agreeing to hire more attorneys, translators and investigators in the five counties that filed suit. The New York legislature has since voted to implement those reforms statewide. By 2023, the state will give counties more than $350 million annually for public defense; about $274 million of that is new Hurrell-Harring funding. It wasn’t an open-and-shut case. The litigation lasted seven years and faced serious challenges to the plaintiffs’ standing from Gov. Andrew Cuomo, who was the state's attorney general at the time. Ongoing cases in other states have met opposition, too, and some of their fiercest opponents are public defenders themselves. In Idaho, they’ve argued the demand simply isn’t there, pointing to the fact that their offices are well-staffed with interpreters and investigators. David Martinez and Anne Taylor, the chief public defenders for Bannock County and Kootenai County, respectively, opposed the ACLU lawsuit using identical language. “My expectation is that if my attorneys believed that their representation was adversely affected by their caseload or workload, that they would inform me so that I could redistribute work,” they both wrote in November depositions. The litigation against the state of Louisiana has drawn varied reactions. “To file a class action alleging everyone’s incompetent so we can get more money for the system — it’s throwing everybody under the bus to try to make a point,” he said. Though he supports the lawsuit, Bunton, of the Orleans Public Defenders, said he understands why others are leery of it. Update: This story has been updated to include mention of the ACLU's co-counsel in the Hurrell-Harring case.